Sygic is the most popular offline GPS navigation application in the world and it is now available to download for free. The app is originally costs around Rs.1300 for iOS users and Rs. 199 for Android users. MapmyIndia made its app completely free for Android to compete Google Maps and users can use it for lifetime. The app does not require an internet connection and it always works with GPS only. The app offers detailed turn-by-turn voice navigation to easily reach your destination. Also it provides support for tablets and smartphones with high resolution display. 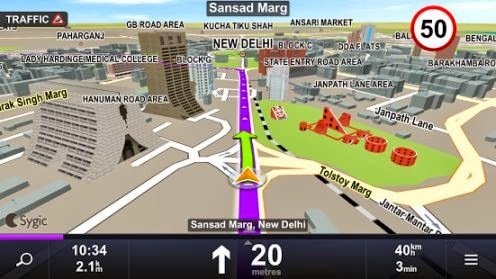 It comes with lot of new features including offline navigation, travelbook, City guides from Wikipedia and Dynamic lane guidance for unknown roads. The Sygic & MapmyIndia app is available free on Google Play. After installing the app, you can also download maps for particular cities or states.